Although we would love to work with everyone that contacts us to enquire about our business plan writing service, we recognise that our business plan writing service is not for everyone. I often say to people who are enquiring about our services that we produce bespoke, thoroughly researched plans that are created not only with a view to obtaining finance or persuading a key partner of the viability of your business but also to offer a detailed blueprint for action. There are plenty of people out there that can dash something simple off using business plan writing software such as Business Plan Pro more cheaply than we offer our service. Just as an off the peg suit with a couple of minor adjustments will inevitably come with a smaller price tag than a hand crafted suit that has been made to measure from scratch, we are not the cheapest provider on the market but we believe that the value for money that we offer is unrivalled. I accept that not everyone wants that or at least are nor prepared to pay a premium for something that is made to measure for their business Many people just want to have something off the peg that ticks the business plan box in the checklist of things to do when starting a business. I usually tell these people that if that is what they want, they would be best served writing it themselves rather than handing over their hard earned money for something that will likely be useless the day after it has been read by the intended audience. Writing your own business plan is time consuming but if you are capable of doing the work and can make the time commitment, it is something that will give you real insight into your business that will help you and shape your business in ways you probably can't even imagine at the start of the writing process. If you can't afford to have someone do it properly, the next best thing is to do it yourself. This recommendation that the entrepreneur looking for a cheap, off the peg plan get it for free by simply investing their own time and energy into the writing process usually segues into a brief conversation about how I would set things out and what sections I would include. I'm happy to share my thoughts on this as I am passionate about entrepreneurial success and want them to do as good a job as possible themselves if we are not going to work together on their business plan. So, I thought it would be useful if I dedicated a blog post to the subject, not only as a reference to which I can guide these people when they call us but also as a resource for anyone else asking the same question. This section boils down the detailed information presented throughout the main body of the plan to it's essence, providing interested parties with a succinct, accessible summary of the business and its future plans. This will provide a brief history to date of the business as well as a detailed description of the services to be offered. The planned evolution of the business should be outlined here as would the critical success factors for that evolutionary journey. A detailed market analysis for every separate strand of the business offering needs be included in this section. This should give an indication of market size, future trends and a market needs analysis. This analysis is critical as it forms the basis of the prioritised and segmented sales and marketing plan later on and will form the basis for efficient allocation of resources in the operational plan. Although the market may well be attractive, this does not guarantee that the industry is attractive for an operator. Industry factors such as the number and comparative strength of competitors will also need to be assessed to arrive at a robust plan and all relevant factors that determine industry attractiveness will be assessed in this section of the business plan. A key factor in determining whether or not your financial projections are credible will be the strength of your team relative to the competition. If there are gaps in the team, this section will outline exactly how these gaps will be bridged (e.g. through working with retained advisers or outsourcing certain tasks). Credible sales and marketing plans are built from the bottom up and take into account financial and other resource constraints that may prevent the business from achieving its financial objectives. A detailed sales and marketing strategy should be laid out, including the key assumptions such as conversion rates for each sales and marketing channel. This section outlines exactly what will be done to ensure that your business achieves its stated goals. It will also outline precisely how these services will be delivered to ensure that the business can satisfy or even delight customers across all the critical success factors outlined in the business description section of the plan. This section should contain a detailed revenue model for the business that is based on agreed financial assumptions. It ought to be developed into a month by month financial forecast for the business including P&L, Cash-flow statements and Balance Sheets that shows the anticipated trajectory of the business for as many years as is relevant (we normally look at three years although I invariably cover the amount of time it will take to fully repay any initial investment or lending. In addition, all start up and working capital requirements should be outlined throughout theyears described. Hopefully, this detailed structure for writing a business plan will help you think through all of the significant issues in advance. I am a big believer in making as many of my mistakes in business on paper as possible. This will not happen if you simply hand over a few hundred pounds to somebody to create something quickly and cheaply using business planning software, as the main issues will never have been thought through and the assumptions in the plan will be almost certainly be lazy ones that have no bearing on reality. True, most assumptions eventually prove inaccurate to some degree but the difference between a business plan and creative writing is the research that goes into vefifying as many of those assumptions in advance as possible. 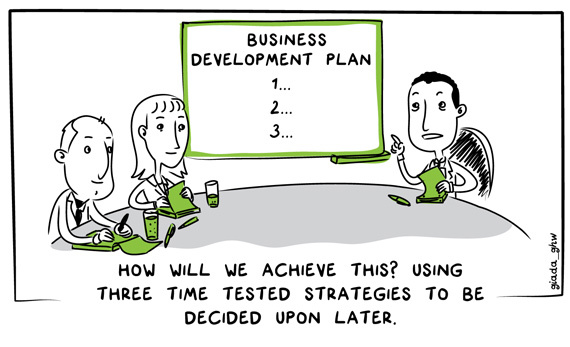 We here at Continuous Business Planning wish you good luck on your entrepreneurial journey and are here for you if you want us to take a look at your own attempts to create a business plan.